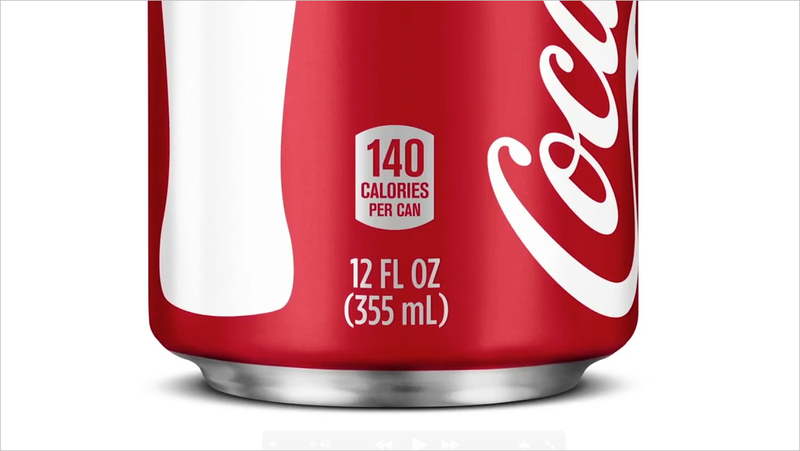 Skinny, happy people drink soda too, says Coca-Cola. The beverage giant is diving face-first into the fray about sugary drinks and health, releasing the two-minute commercial below, patting itself on the back for helping to solve the problem while simultaneously trying to shift some of the blame to other, unnamed foods and, perhaps most oddly, to consumers themselves. The spot, created by agencies Brighthouse and Citizen2, is notable in part for what it doesn't emphasize—two-liter bottles, Big Gulps and people struggling with obesity. Yet it still manages to be particularly—and shamelessly—insidious for the string of sugary products it parades across the screen while trying to make the case that it's focused on serving up products that are better for consumers. It's kind of like someone smiling at you and telling you, "Why, it would be a shame if you stabbed yourself with this knife, but if you really want it, we'll sell it to you." Mostly, it's a surprisingly ham-fisted answer to the latest attacks on the soda industry from public health crusaders like New York Mayor Michael Bloomberg and the Alex Bogusky-aided, polar-bear-amputating Center for Science in the Public Interest, which wasted no time calling Coke's new campaign "just a damage control exercise, and not a meaningful contribution toward addressing obesity." Overall, the ad spins the issue so many different ways that it's difficult not to see all of them as thinly veiled attempts at manipulation. And it's easy to imagine the marketing bogeyman holed up in a windowless room, tapping his pen against his forehead as he tries to come up with the most Machiavellian way of making Coke look good on this issue. Sure, the numbers about juice and diet sodas in schools seem compelling, and the spot's energy might have been better focused there. Then again, it's not necessarily the best argument, given yesterday's NIH study linking diet soda to depression. While the ad's use of a popular "common-sense" Republican catchphrase is a clear shot at painting political opponents as big-government, the subtext for consumers translates roughly to "If you're fat, it's your fault. Drink a diet soda, idiot. Get on the treadmill. We gave you options. Not our problem." Or, as the voiceover gleefully chirps, "If you eat and drink more calories than you burn off, you'll gain weight!" Thanks for the pointer.